1. Comfortable with natural-feeling, breathable and lightweight, wicks sweat and dries fast. 2. Great for training, exercise, fitness, sports, outdoors, or simply as daily wear etc. 1. 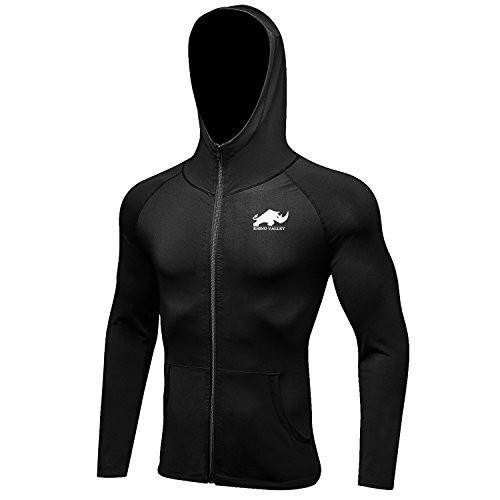 Rhino Valley is a brand that specialized in apparel, shoes or fitness related accessories. 2. Everything we make with passion, design, innovation are all for your natural movement and better life. 3. We stand behind our products with hassle-free return or replacement warranty, easy-to-reach customer service and satisfaction guarantee. For manual measurement or different measuring methods, please allow 1-3cm measuring deviation and refer to the size chart to pick right one. Material: 85% polyester + 15% spandex, high stretchable elastic and breathable fabrics, sweat-absorbent and quick dry, very comfortable to wear, great for training, running, cycling, workout or daily wear etc. Hooded design that to avoid cold infiltration and keep warm while doing exercise, beautiful and practical,not easily fade and deformed. Ergonomic cuffs design, better to fit wrist, anti-wrinkles, ensure the flexibility to movement, improve the sense of comfort. Exquisite metal zipper closure, smooth to pull and wear-resistant, convenient to put on and take off. Come with pockets, which allow you store items easily, add extra practical functionality. If you have any questions about this product by Rhino Valley, contact us by completing and submitting the form below. If you are looking for a specif part number, please include it with your message.